In 2016, Warner Bros. Pictures and writer J.K. Rowling pulled off the impressive feat of kick-starting a new movie franchise set in the same “Wizarding World” as the Harry Potter series. 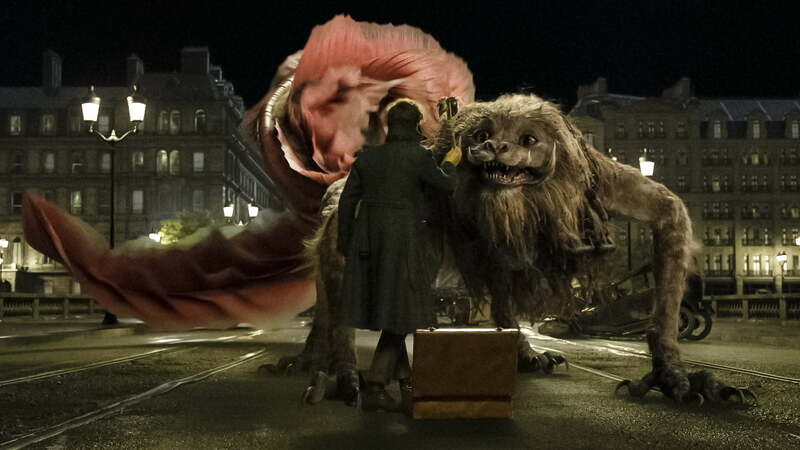 Set decades before the events of the eight-part saga, Fantastic Beasts and Where to Find Them was a critical and commercial hit, earning acclaim for its magic-infused vision of 1920s New York City and the colorful, fictional creatures let loose upon it over the course of the film. Fantastic Beasts went on to earn two Academy Award nominations for its production design and costume design, taking home that year’s Oscar for the latter. This year’s sequel, Fantastic Beasts: The Crimes of Grindelwald, appears to be following suit, having already been named as one of the preliminary contenders for an Oscar in the visual effects category. Visual effects studio Rodeo FX worked on both films, bringing to life the amazing animals and breathtaking cityscapes. After delivering a version of the Big Apple that hid magic around every corner, Rodeo FX and VFX supervisor Arnaud Brisebois turned their attention to 1920s Paris for The Crimes of Grindelwald, which explores the secret headquarters for magic users in that famous French city, as well as several other locations well-known to Harry Potter fans. Digital Trends spoke to Brisebois about his team’s work on Fantastic Beasts: The Crimes of Grindelwald, as well as its work on another popular franchise with a decidedly different tone: The two-part adaptation of Stephen King’s It. Digital Trends: Having worked on the first Fantastic Beasts, how did The Crimes of Grindelwald feel different? Arnaud Brisebois: Mechanically, it was very similar. I’ve worked for Warner before, but working with [visual effects supervisor] Christian Manz was new. This whole franchise is very renowned and has this big aura, but the work was similar. … The first film was much more creature work, and a bit of environment and a few big effects shots, but it was really a lot of stand-alone shots. In this film, it was a lot of environment work, and the scope of work also kind of doubled from the first film. There wasn’t much more effects work this time, and barely any creature work. You didn’t do as much creature work this time, but the magical beasts are still such a big part of these films. What is the creative process like when it comes to bringing so many “fantastic beasts” to the screen? The development phase for creatures is typically done in preproduction very early on, based off descriptions from J.K. Rowling’s books. She describes all of them, and there are a few little scribbles and drawings. So there’s a lot of inspiration based on these descriptions. … The process is really dynamic [and] starts with really simple black-and-white sketches and drawings just to flush out ideas and silhouettes. And then it gets refined with a bit of color and whatnot, and then into sculpting fairly early on, so that we can move into locomotion and behavior tests. Form follows function, so sometimes something that looks good might not move well and it needs to be revised. Animation is introduced fairly early on in the process, and then it’s a balancing act between how that thing is looking and how it’s moving. So that’s the process overall. There are a lot of people involved. … It’s a big family. A lot of your work this time around was on the new locations: The French Ministry of Magic and the streets of Paris in the 1920s. What were some of the challenges there and highlights for you? Paris was completely different from New York. Where New York was really solid and straight and austere, Paris is very romantic, very decorative, and very crooked. It was also very dirty relative to the same era of New York. Paris was using lots of charcoal at that time, so the buildings were really dark and dirty. Our work involved a lot of learning how the city was built, because [the production designers] were very precise in how they scanned huge sections of Paris and then built the back-lot set with Parisian streets’ and buildings’ dimensions, so it could be extended with more of the Parisian streets. It was very accurate, and very complex. It was like a big puzzle. You also got to put your own stamp on some locations from the original movies with scenes in the London Ministry of Magic, Hogwarts, and other familiar places, but set decades before the Harry Potter movies. How did you approach that aspect of the project? A big highlight for us was the London Ministry of Magic. It’s a Harry Potter throwback. and so we were provided with [production designer] Stuart Craig’s original set plans for that environment. I think it was from Harry Potter 3 and 4, or possibly 4 and 5. In the original plans, we saw one atrium and one other, specific area, and we needed to expand it to see the whole environment. So we started from these original set plans, as well as some revision plans that were provided, and we had all the original builds and those scans for photo reference to work from. We actually had to rebuild the old Harry Potter environment. That was really fun because it felt like we were even more of a part of the Potter world. Some of the hero sequences in those environments had us going into even more detail as far as architecture for effects work. It required a real understanding of how buildings were built at the time structurally, inside and out, so that we were able to destroy them later. So that was a bit of a learning process as well. What were some of the challenges with the London Ministry of Magic scenes? Well, it’s basically like a skyscraper, but empty at the center, with all of these offices wrapped around the cylindrical chamber. So there are thousands of offices with crowds within them. Lots of work needed to be done in order to bring all of that to life. You’ve worked on some very grounded films, but most of your projects tend to be on the far end of fantastic, like Fantastic Beasts, It, Warcraft, and Miss Peregrine’s Home For Peculiar Children. Does that kind of project appeal to you more from a visual effects perspective? In my opinion, it’s always more interesting to work on something that has the tangibility of reality but that is more interesting in its design. I’m not so interested in blowing up the White House or something like that, and that’s why I end up getting all these projects at Rodeo, I think. It’s not that it’s more creative, because it still needs to feel real. What’s on the screen still needs to be processed like a real object the same way you do anything else, but it’s the design aspect that becomes really interesting for me. With this franchise especially, and with Stuart Craig’s work on it, the aesthetic is so rich and so well-thought-of and so well-balanced. Part of why these films endure and please so many people is that the universe you’re being brought into is given a lot of depth and feels like it’s an alternate reality, but still real and very beautiful at the same time. You see a lot of things you’re not expecting. But the challenge is always the same: It needs to feel photo-real for the audience. It might even be slightly more challenging when you’re doing something that is extraordinary in design, because you need to maintain this suspension of disbelief. You need people to feel they can walk in there and they can touch this or that. So yeah, that’s why I like these projects so much. Shifting gears a bit, you also worked on It and the upcoming sequel, It: Chapter Two. What has that experience been like? It’s funny, because I’ve been living this Groundhog Day-type experience for three or four years now. First it’s Fantastic Beasts, then It, then Fantastic Beasts again, and then It again. I only had a small break doing Paddington 2 with [director] Paul King in the meantime. But yeah, it’s a completely different tone obviously, and completely different type of director as well. Andy [Muschietti, It director] is great and he’s got so many ideas. I think he made It very contemporary in its style, and he’s got a great eye for that. I like the decisions he’s making. The first It was really a labor of love because it was a bit of a gamble for the studio with a new director and with this huge theme, and the book, and Stephen King, and everything else. There was a lot of pressure, and it could have bombed quite easily. So they were very careful with their investments on the visual effects side, and we needed to be very careful in how we were building things, where we were investing, and just how we were approaching problems. Given how open-ended Fantastic Beasts is, how did it feel to see It through to the end from a visual effects standpoint? Working with Andy again felt really natural, and it felt natural that we would tackle the second part of that story. I’m really glad, because with the Fantastic Beasts franchise, I’m up for another three films, so that’s another six years or so with that world. What’s great with It is that there’s this idea of a battle spanning a 27-year story, but it’s a battle that we’re able to see to the end — so I’m really glad that we’re going to be able to kill this clown off for real and it will be over. Yeah, I like working with the same team on Fantastic Beasts, and I really enjoy working with Christian. The more we work together, the less he has to describe things to me or ask for anything. … So I’m excited about all of that, but I’m also curious to see what’s going to come next, because as you evolve in this business, you always want another challenge — something you haven’t done before or something that’s going to need you to figure out new solutions and ideas.